Populism and a waning national appetite for vital reforms threaten European integration, putting at risk the continent's prosperity and raising the specter of falling incomes, according to European Central Bank President Mario Draghi. The European Central Bank has bought governments time with its super-easy monetary policy, yet reform efforts looks to be softening, a major worry as productivity growth is already weak, innovation is low and aging populations will be a huge drag, Draghi said. "Monetary policy is providing support and space for governments to carry out necessary structural reforms," Draghi said in a speech in Madrid. "It is a window of opportunity they should seize." In a clear sign that the ECB is not about to end its easy policies, Draghi said the bank would next week examine a combination of instruments and timeframes, like the size and time horizon of its bond purchases, to support the economy. Yet such policy can only prevent weak growth from getting entrenched, and it is up to governments to finally restore economic health nearly a decade after the start of Europe's economic woes. Euro zone growth, sluggish at 1.7 percent in 2016, may even slow next year as the central bank has exhausted much of its firepower and national governments have done little. Indeed, looming elections in countries like France, Germany and the Netherlands, all with rising populist movements, raise the risk of the political agenda being hijacked by anti-establishment rhetoric, delaying real policy action and keeping a heavy burden on the ECB to prop up growth. 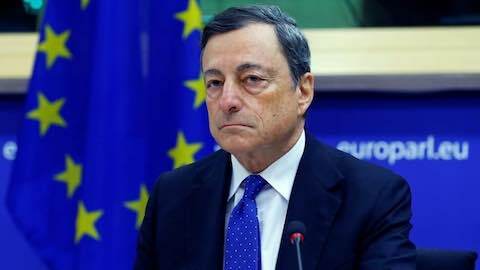 "European integration is the appropriate response, but this has become weaker in recent times, partly because of populist movements," Draghi told El Pais newspaper in some of his strongest recent comments on political developments. "It is increasingly difficult to make progress with integration." Draghi did not name particular parties. But a string of movements has shaken up the political landscape, including Britain's UKIP, which helped drive the Brexit debate, and France's National Front, which wants its own anti-EU referendum. His comments holding up integration as an answer to security concerns came as the European Commission was due to present its biggest plan in more than a decade to revitalize the 96 billion euro defense industry with a new joint research fund. Warning that Europe is not on the right path, Draghi noted that productivity growth is barely sufficient to offset the drag from aging, a risk that incomes fall, a potentially dangerous spiral in any economy. "Population aging will result in a stark fall of output per capita," Draghi said. "Without concerted effort on structural reforms, per capita income growth in the euro area is likely to stagnate, and may even decline." Governments need to revive innovation, foster technological advances, put more of their population to work, and make it easier for new firms to enter markets, even if some of the needed measures are unpopular, he added. Europe: "European Integration, Prosperity at Risk"